Should the Maple Leafs Trade William Nylander for Wayne Simmonds? Should the Maple Leafs Trade Nylander for Simmonds? It’s been a roller coaster year for William Nylander. First, he successfully held out for a larger contract, and second, he had a frustrating on-ice start to the season and it took more time than anyone wanted for him to find the scoresheet. 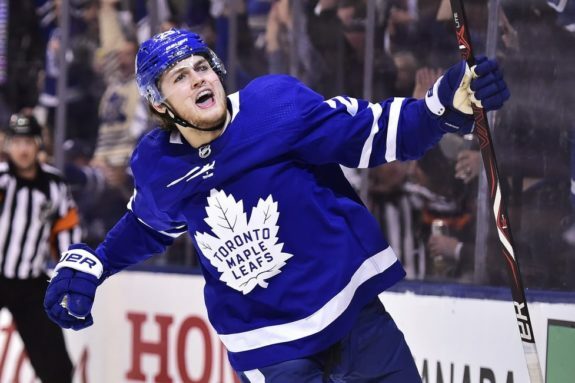 I’m sure the Toronto Maple Leafs are pleased, both that the contract and the scoring woes are in the past and that Nylander is starting to contribute regularly as the team moves towards the playoffs. A postseason appearance which, unless disaster strikes, looks like destiny. Is it possible that, just when things seem to be getting comfortable, drama might again unfold in the life of this young Maple Leaf winger? I admit I was surprised when, in my scouring around Maple Leaf news, I saw that Howard Berger of the site “Between The Posts” threw out the idea of trading Nylander. I had heard “trade Nylander” talk during the contract negotiations, but I chalked it up to bad attitudes by fans who were miffed at the youthful player for putting self first and team second. Why would a team trade such a valuable commodity, especially when they fought hard to secure his place on the team? I suppose the answer is obvious, and Toronto fans have seen the results play out this season when their beloved Raptors traded fan-favorite Demar DeRozan for the quiet, enigmatic and amazingly-skilled Kawhi Leonard. But, because that trade seems to have worked well, perhaps a closer look at Berger’s idea is appropriate. Here’s the proposed trade idea. Berger believes the Maple Leafs should consider swapping forwards with the Philadelphia Flyers – Nylander for Wayne Simmonds. First, I will go on record that I don’t think this proposed trade will or should happen. That said, such a trade isn’t without logic as it seems to address a need I agree the Maple Leafs have. In my mind, injuries aside, they have two needs: first, they need help on defense, and second, they need to be tougher. By that, I mean smart-tough, in the way the Boston Bruins are. Berger notes that Simmonds, the Flyers’ power forward, should be attractive to the Maple Leafs because he’s a strong player with a streak of toughness who’s available this season. Berger believes the highly-talented Maple Leafs simply don’t match up well with the Bruins because Brad Marchand, David Krejčí, Patrice Bergeron, David Pastrňák and Torey Krug represent a style of toughness that’s too difficult for the less-tough Maple Leafs to handle. He also foresees a possible first-round matchup between the them and the Bruins which, as history suggests, would likely result in the Maple Leafs’ playoff exit. So, what about the Flyers’ Simmonds? First, he’s a highly-coveted, unrestricted free agent after this season. Darren Dreger of TSN reports that the Flyers haven’t made a decision about his future, but believes Simmonds doesn’t want to wait around to see what happens. Interesting. The terms of such a contract sound familiar for those who followed the Nylander signing, don’t they? Since Simmonds moved from the Los Angeles Kings to the Flyers to start the 2011-12 season, he’s been a strong player. Twice he’s had 60-point seasons (2013-14 and 2015-16), but his scoring appears to be trending downward the last two seasons. This season he’s on-pace for about 36 points. As well, over the past few seasons, he’s had a regressing plus/minus, which might be chalked up to the Flyers’ weakness as a team. Or, it might be that Simmonds fits the category of a power player whose style of play puts him at risk of rapidly fading, as has been the case of the Edmonton Oilers’ power forward Milan Lucic. A long-term contract for Simmonds now seems like a bad financial bet. But Simmonds does have some attractiveness for the Maple Leafs. He’s a home-town guy, from Scarborough, Ontario. Secondly, as noted earlier, he addresses a need that Maple Leaf fans notice – team toughness. I don’t disagree with Berger’s assessment that Simmonds would bring added value to the Maple Leafs at the Feb. 25 NHL trade deadline. But, trading the 22-year old Nylander to get him? That seems like a crazy plan for the Maple Leafs to follow. Nylander has too much potential value to the team, and Simmonds is much older (eight years). The Flyers would seem unwise to simply assume Simmonds would re-sign with them if they wish it. 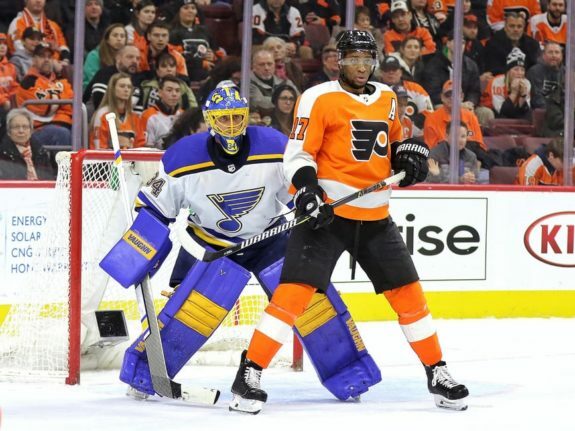 The Flyers are currently last in the Eastern Conference, and it’s hard to think that a team such as the Maple Leafs, with the attractiveness of future success, would not be desirable for an aging warrior like Simmonds. That’s especially true if he still thinks of Toronto as home, as John Tavares did last summer. Still, I keep returning to losing Nylander to make this scenario happen. It seems like a poor idea to me, regardless of how attractive the go-for-it-this-year mentality is. If the Maple Leafs can figure out a way to get Simmonds without eroding their future, I say go for it. Otherwise, it’s time to trust the team and Mike Babcock to figure it out as they go.